A change of emphasis with the simulations this week as we ignore the bottom "half" of the competition ladder and, instead, look only at the likely composition of the final 8. Firstly, here's the usual summary of ladder position by team. So, based on my simulation inputs (which are the latest team MARS Ratings and the bivariate Normal distribution I described in an earlier post), Hawthorn are justifiable short-priced favourites for the minor premiership, with Sydney and Adelaide the only other teams nurturing any hope of finishing atop the ladder, each with about 9/1 odds of doing so. Collectively, Hawthorn, Sydney and Adelaide are virtually certain to fill the top 3 spots on the ladder, with Collingwood and West Coast both about even-money chances to take 4th. It is possible for Adelaide to finish as low as 4th and for West Coast to finish 3rd, but this occurred in only about 1-in-200 simulations. Whichever of the Pies and the Eagles fails to grab 4th will instead very likely slip into 5th, while the Cats are the team most likely to finish 6th, the Roos 7th, and Fremantle 8th. Given all the simulated probabilities for ladder positions shown here, no wager in the current TAB AFL Futures markets has a positive expectation, which I guess means that the TAB Bookmaker now has broadly come around to agreeing with MARS. If we look at the composition of the final 8 in totality across all 100,000 simulations, rather than focussing on just a single team at a time, we find that 69 arrangements of the eight teams are mathematically possible, though only six have probabilities of greater than 5%, and the top two soak up more than 25% of the total probability between them. The second-most likely final 8 swaps the Roos and Freo in 7th and 8th but makes no other changes, while the third-most likely is more radically different in that it sees the Eagles finish 4th, the Cats grab 5th, and the Pies get relegated to 6th. The fourth- and fifth-most likely combinations have the Swans filling the second ladder position rather than the Crows. One arrangement appeared only once in the 100,000 simulations. It had the Swans taking the minor premiership, the Hawks finishing second, Adelaide and Collingwood rounding out the top 4, then, in order, the Eagles, Cats, Dockers and Roos. With an estimated probability of just 1 in 100,000, this combination is only one order of magnitude more likely than that we eventually determine the recent observations pointing strongly at the existence of the Higgs' Boson were merely a statistical fluke. Lastly, it's interesting to look at the probability of the various possible matchups for each of the Week 1 Finals. For the Final pitting 1st against 4th, a Hawks v Pies clash is a better than even-money prospect. Next most likely is a Hawks v Eagles matchup, which is about a 3/1 shot. The only other pairings with probabilities that aren't vanishingly small are Adelaide v West Coast (10%), and Sydney v West Coast (9%). The Final for 2nd v 3rd is almost certain to pit the Crows against the Swans, though the chances are about 50:50 as to whether it'll be a Crows or a Swans home game. Combined these two avian permutations have almost an 80% probability. Again there are only two other pairings with non-trivial probabilities: Hawthorn v Sydney (10%), and Adelaide v Hawthorn (9%). More variety is on offer for the Final involving 5th v 8th, with all eight possible combinations carrying probabilities of 7% or more. Mostly likely is a West Coast v Fremantle pairing with odds of about 4/1, though it's only slightly more likely than a West Coast v Kangaroos pairing, which has odds of about 5/1. 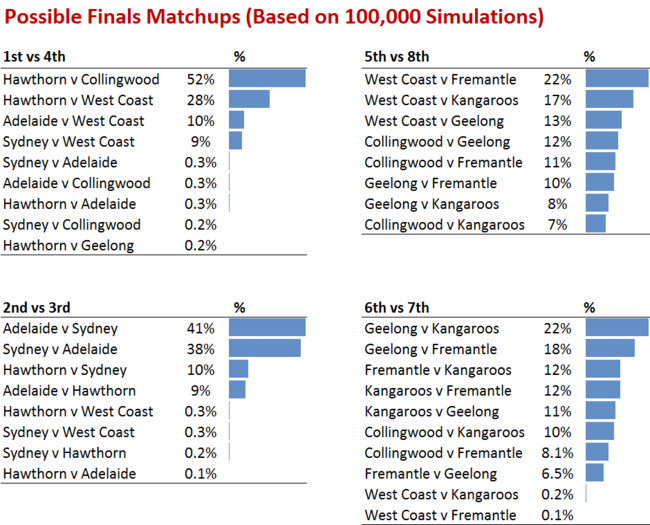 There's also a wider range of possibilities for the 6th v 7th Final where again there are eight combinations with reasonable prospects, most likely amongst them the Cats v Roos (20%) and Cats v Freo (18%) matchups.